My current brewery has one limitation many home brewers won’t have. I live in an apartment (or condo) and my only brewing space is on the balcony. I have water and power on the balcony but I can’t leave my brewery there when I am not using it. It needs to be packed up and put in the garage when done. I can almost fit all of my gear on one trolley on the way to the balcony. On the way back, having a full fermenter causes a few balancing issues. The brewing process starts with the grains. I do this in the garage in the basement, where I store the brewery when not in use. I found out the hard way that it is best to keep the grain milling away from the post boil transfer (this will make sense later) so grain dust doesn’t get in the wort. I have a Monster Mill (https://www.monsterbrewinghardware.com), which I bought directly back when the AUD was strong. I made my own base and hopper. The hopper is made from thin plastic cutting boards and steel plastering corner because they were in the hardware store when I was making it. 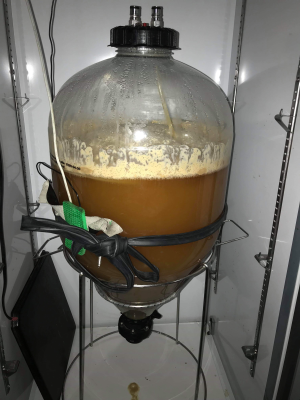 My set up is based on a Braumiester 20 litre single vessel system. I also have a 12 litre hot water urn for a Hot Liquor Tun or HLT, which is a fancy brewing name for a supply of hot water. You can read about the Braumiester in plenty of places. Mine is modified with a barbed tap so I can connect it to a pump. I wrap it in an old yoga mat to reduce to energy consumption and heating times. This is really worth doing. I also changed the lid handle so the lid sits upside down when stored. 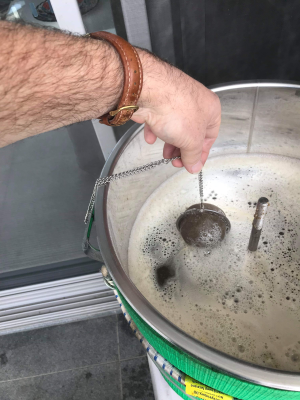 I use great big tea strainer balls or hop balls to keep the used hops from clogging up everything. If you have three, then you can do all three hop additions without any problems. They all have chains I can attach to the Braumiesters handles. 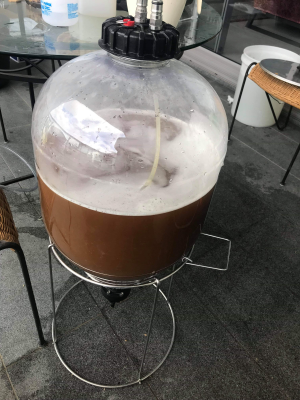 My chiller is a counterflow chiller I was given by a friend after I helped him sort out his backyard brew shop. I use a magnetic pump to push the wort through it. I reticulate until the temerature is low enough then feed it into the fermenter. It is cheap and works fine with the pump. I also love to use big plastic clamps to hold the silicon pipes in place. (see above). I have just started to use oxygen to aerate my wort. It really gives the yeast a good kick start. 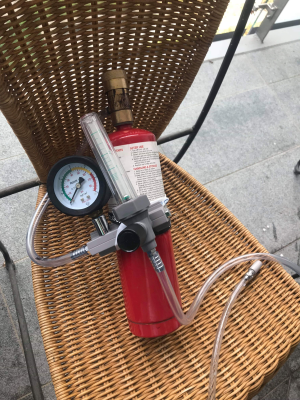 It is an oxygen flow meter, and air stone as used in fish tanks and a tradies oxgyen bottle all hacked together with some plastic tube. The hardest part to source was the tap. 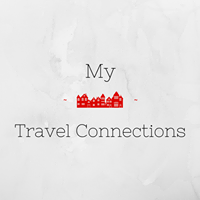 If you want more detail, send me a message via the contact form. To ferment I use my Fermentasuarus. It is a PET conical fermenture and I use the pressure option. I have it in a teperature controlled drinks fridge from a shop. You need a big fridge for a Fermentasuarus. The fidge is in the basment.